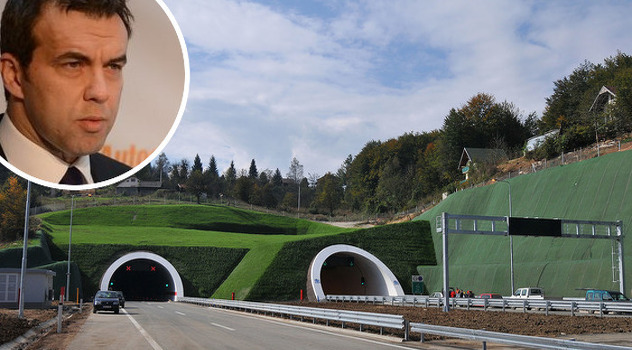 According to the analysis of the preliminary project at the Corridor 5C on the route from Konjic to Mostar, that was done by the PE Highways of FBiH, the south part of the highway A1 could be moved and go through the mountain Prenj, which will bring a saving in amount of 300 million euros. With the variant through Prenj, i.e. moving of the route to the east on the entire stretch from Bradina to Mostar, route will be shortened by 18 kilometers and achieve the saving of 309 million euros, claims Karic. In the first phase, a one pipe tunnel 9.5 kilometers long should be built, and everything would be ready for the second pipe, when conditions and needs are fulfilled. EP Highways of FBiH proposed an optimization of the route Konjic-Mostar to the Government of FBiH, which approved this proposal in July last year and gave a green light for creation of new preliminary project that is in progress now. The new variant of this section that passes through Prenj enables completely different scenario of the development of Corridor 5C taking into account limited capacities of the Federation of BiH for further borrowing and makes the section more acceptable for potential investors. With the optimization of the route, Jablanica loop is only seven kilometers more remote than it was intended with the initial preliminary project, and by proposed traffic solutions, needs of local population will be respected, and significant saving of 309 million euros could be used for the construction of the section Doboj Jug-Zepce that is 38 kilometers of highway, as said from the EP Highways of FBiH.